The species is distributed in Dalmatia, Southern Russia, Southern Urals, Kazakhstan, Caucasus, and in Asia Minor to Kopet-Dagh. Armenia is inhabited by subspecies P. a. hyrcana (Staudinger, 1901) - the endemic of Transcaucasia. The species mainly occurs in semi-deserts, juniper woodlands, and dry mountain steppes occupying elevation range from 800 to 1800 m a.s.l. The known larval host-plants are Festuca valesiaca and F. ovina. The species gives one generation per annum having butterflies on wing from late April in the Southern Armenia till early June in central parts. The species is rare to uncommon within typical habitat, showing the highest density in juniper woodlands of South-eastern Armenia. 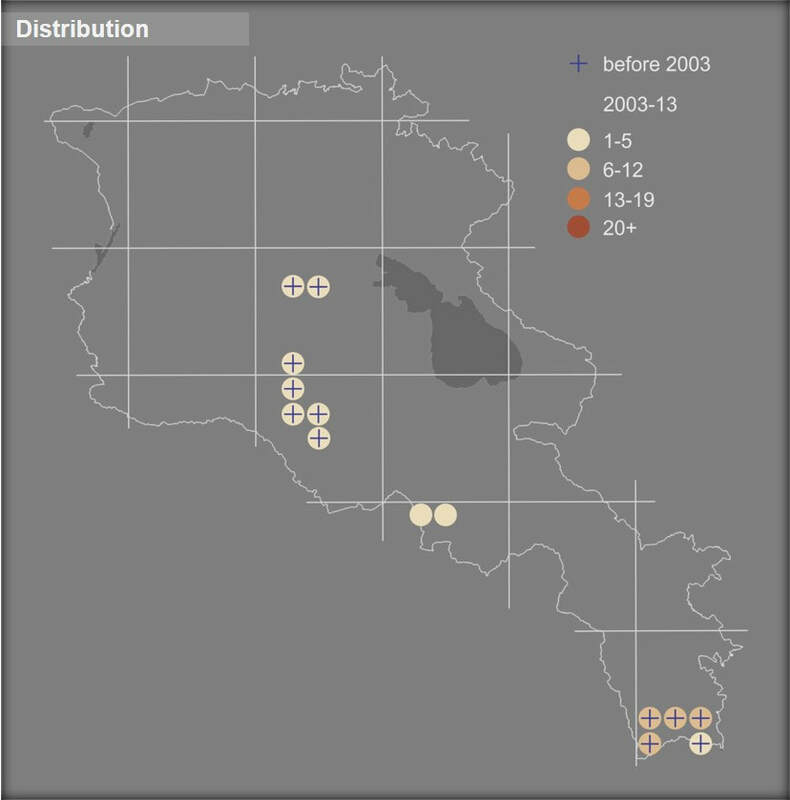 Population trend during 2003-2013 demonstrates moderate decline (p<0.05), which possibly could be related to intensive grazing of goat and sheep mixed herds in juniper woodlands and dry steppes of southern Armenia. The species is not included in the IUCN Red List, but it was evaluated for European Red book as a Least Concern and for Armenian Red Book as Vulnerable VU B1a+B2a. The current situation would suggest leaving the same national conservation status for the Steppe Ringlet. The species' distribution range is partly covered by Zangezur Biosphere reserve, Gnishik Protected Landscape, and Khosrov Forest State reserve, as well as in the Emerald Sites, which are covering the named Protected Areas. The species is presented in Agarak, Meghri, Kaladash, Shvanidzor, Gnisheek, and Ourtsadzor Prime Butterfly Areas. It is important to designate the other spots of species' distribution as Prime Butterfly Areas, with their further transformation into Emerald Sites and development of the management plans for those areas. Also it is important to continue the species' monitoring and to develop the habitat friendly grazing schemes, which can support the species' host plants and increase survival of Steppe Ringlet.